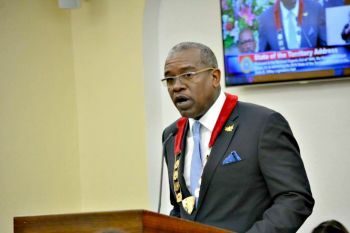 ST. THOMAS, USVI — Governor Albert Bryan delivered his first State of the Territory Address on Monday, January 2019, via a long-anticipated speech as residents and lawmakers alike sought an understanding of how the newly elected governor intends to lead the government, his plans to make the USVI a better place to live, and how he would prioritize the daunting issues the islands face. The governor wasted no time in laying bare the current state of the United States Virgin Islands, describing the territory as being “distressed,” even as there remains a window of opportunity right the ship. He mentioned the benefits the USVI realized through the influx of federal dollars after Hurricanes Irma and Maria, which resulted in the growth of the construction industry, and spoke of activity at the Limetree Bay Terminals that has boosted St. Croix. He then spoke of the briefing he received from former Governor Kenneth Mapp’s financial team. “They revealed to us that the longstanding fiscal problems that plagued our government before the 2017 hurricanes have yet to be resolved,” Mr Bryan said. “To put the true state of our territory’s financial status into perspective; the Government of the Virgin Islands could not have met its day-to-day expenses over the past 12 months if not for the availability of FEMA community disaster loans,” he said. Both the VI and USVI are in dire economic strait. The USVI was fortunate that it had FEMA to offer a life line to keep it afloat. What did the VI get from the UK? £10M grant and a conditional £300M loan. Then £300M requires the VI to establish an RDA, an alternative government. The CEO is allegedly being paid over $300, 000.00 per annum. Both group of islands must be better stewards of their limited financial resources. The UK and US taxpayers are not gabby about keeping the islands afloat. As the governor of the USVI, he should be aware that the islands that he governs legal name is the United Stated Virgin Islands and not the Virgin Islands.